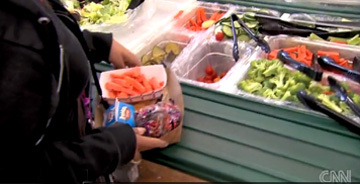 This CNN piece highlights the improvements in S.F.’s school meals that have been brought about through the hard work and collaboration of our Director of Student Nutrition Services, Ed Wilkins, and the Student Nutrition and Physical Activity Committee. (Tom Vilsack, the Secretary of Agriculture comes off as a moron, but that’s another story). The takeaway message? If you want school meal improvements to continue, $2.74 per meal isn’t enough! Congress is proposing a six-cent increase in that amount, but what we really need is for reimbursements to be indexed to reflect higher or lower costs of living in different parts of the country. $2.74 goes a lot further in parts of the Midwest than it does in California. This entry was posted in issues and tagged school lunches, student nutrition. Bookmark the permalink. When Caroline and Ed Wilkins and I (and many other long time members of the district’s student nutrition committee) all began trying to improve the elementary school lunch beginning in the 2004-05 school year, the menu consisted of hot dogs, corn dogs, “chopped and formed” chicken nuggets (not quite as bad as that Jamie Oliver “put the whole chicken in a blender and grind it up” mess, but close), fried potatoes for the “vegetable” most days, canned fruit swimming in heavy syrup, and frequent desserts such as chocolate cake, apple turnovers, or cookies with icing to fulfil the “grain” requirement. There was never a fresh vegetable seen, not even baby carrots; there was never a piece of fresh fruit, ever! All breads and buns were white “balloon bread” , that spongy stuff pumped with air and made entirely of white flour with the nutritious bran and germ removed. All rice was white rice; all pasta was made only with white flour – no whole grains were served, ever. Every year since 2004-05, there have been improvements made. First, we insisted that canned fruit be eliminated and replaced with fresh whole fruit; as a courtesy to parents who complained that their 6 year olds with missing front teeth couldn’t bite into a whole apple, we added unsweetened applesauce or pineapple bits in juice (not syrup) occasionally. Cookie, pastry, and cake desserts were eliminated. Next, we started serving baby carrots, and soon were able to add fresh raw zucchini, celery, jicama, and cucumber. This year, raw broccoli and fresh dark green leafy greens are starting to appear in the elementary schools. 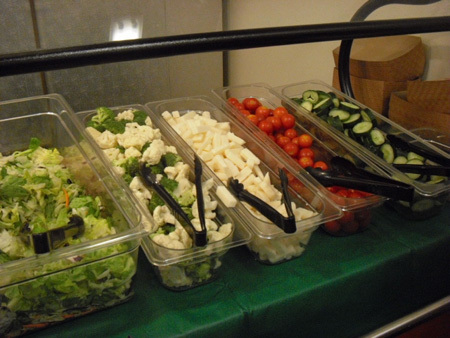 A few ES got salad bars, although the cost of the additional labor needed to operate them continues to limit expansion at the ES level. Whole grains started to appear a few years ago, and finally this year virtually all of the bread, pizza, rice, and pasta is whole grain, even the hamburger and hot dog buns. Students used to complain that on hot dog or burger day, the buns packaged inside the USDA-mandated plastic overwrap were soggy, so we moved to a design which has the meat inside the plastic wrap, but the buns are freshly delivered and offered along side in a large basket; sogginess be gone! There is no question that the meals are far healthier now – less fat, less sugar, less processed fruit and veg and grains, less additives – than 6 years ago. Could the meals look more appealling? Hell yes – and this is something we continue to badger our meal provider to address. I think Preferred Meal Systems got that message loud and clear when they attended the USDA event at Francisco Middle School a few weeks ago and heard from students who interviewed their peers about the school lunch; the number one complaint from the students was about the appearance of the hot entree. This is something I had been telling them for years, but hearing it directly from their customers, the students, had a much greater impact than hearing it from a parent who is always bitching about something or other. I mean jeez, guys, would it really break the bank if you put a little parsley on that “symphony in brown” dish of meatloaf, potatoes and brown gravy? Could the meals be even healthier? Maybe – but not without a huge infusion of more money, and the six cents per free lunch proposed in the stalled reauthorization of the child nutrition act is not going to cut it. We already are serving fresh vegetables several times a week, with potatoes reduced from 4 times a week to 4 times per month (and never fried); fresh fruit most days, and whole grains daily. Trans fats were eliminated several years ago, as were preservatives, artificial colors and flavors. We all want our kids to have scratch cooked meals made from fresh high quality locally grown ingredients, but that would require a central kitchen which we don’t (yet) have. A study is about to begin to determine the potential cost of such a kitchen (or several smaller kitchens around the city), so that it will be known how much money must be raised, probably via a bond, to get that kitchen built. When the time comes to campaign for the bond, I hope every parent who has ever complained that “school food is unhealthy” will get out and work the neighborhoods to build support for the move to scratch cooking. This is the only way we will be able to move our school food program to the next level. Taking the liberty to reply for Annie, no, they were in SFUSD elementary schools quite recently so they’re reasonably up-to-date on lunch offerings. Oh, and if Annie’s kids were in elementary school more than 6-7 years ago, the lunches were a different (and much less healthy) animal then. I logged on to add to Rachel’s comment that I thought the tomato-mozzarella-pesto on whole wheat, which I’ve had at Lowell, was so good that I’ve been hoping to stop by just to buy lunch when I’m in the area at noontime. For $3, with carrot sticks, a whole fruit and a milk, it’s hard to beat. But since I’m here I’ll respond to Annie too. I think the problem with the elementary school lunch is more that the entree looks unappealing packed tightly into a container and covered with steamy plastic wrap. 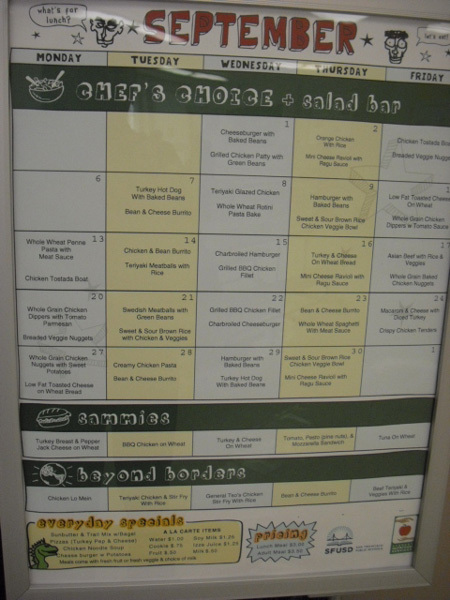 I had a temporary job with Student Nutrition Services in the spring and tried to buy school lunches whenever I could, so I could get a good idea of what they’re really like. I honestly think that if the very same item were given a nice presentation on an attractive plate with appealing garnish, it would taste pretty good. Unfortunately, I can’t think of a way to remedy that. 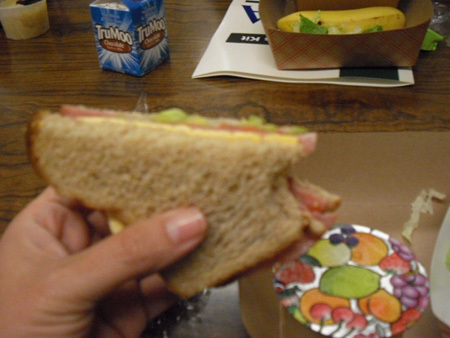 The lunches are healthy based on USDA and SFUSD Wellness Policy standards, though. I’m supposed to watch my sodium and that’s a concern with school lunches, but otherwise they meet some fairly rigorous standards — low in fat, based on whole grains as much as possible, providing servings of vegetables and fruit, nothing fried, etc. I’m not sure why parents just assume that they’re unhealthy. One day when I was at Lowell, the fruit offered was a choice of apple or green pear. All the kids were taking the apples, as the pear looked pretty unripe. When I bought lunch I took the pear, so the caf wouldn’t run out of apples. Then I decided I’d do the healthy thing, grit my teeth and eat it. Surprise — it was perfect — just the right ripeness, sweet but not too, juicy but not too. How come a pear that good can’t be made to look as good as it is? They needed a presentation of sample pieces on toothpicks like at the farmers market. This actually looks really great. Wish the same options were available to the kids in elementary school, who are still forming eating habits for life. While my family has now left the public school system, I remember my kids complaining about the ‘stinky school lunches’ and having to caution them not to disparage school hot lunch because some kids had no choice but to eat them — in 6 years in public school, my kids NEVER ONCE chose to eat school hot lunch because it was ‘disgusting.’ And I agreed, at least in the elementary schools. Disgusting, and also not healthy, nutrition-wise. Glad to seem some changes starting, but it needs to be more.